Senator’s Schumer and Graham approach the White House on Immigration Reform…..
As a follow-up on the piece the Dog did a day or two ago….we now find that two Senator’s mentioned above have already spoken to the White House about attaching some form of Immigration reform to the Healthcare Bill…..
To the Dog…. this a back channel admittance by Graham that 1) Immigration will be nearly impossible to go it alone…..and 2) That he expects the Healthcare Bill to pass……. 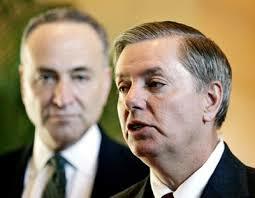 One other thought…though Graham is in trouble with hard righter’s in South Carolina…..he is well aware that the Latino/Hispanic voter numbers are increasing in his state…..
Oh, yea….You all know Schumer is a Democrat and Graham is a Republican….right? Here’s the MyDD piece by Charles Lemos……. Senator Charles E. Schumer, Democrat of New York, and Senator Lindsey Graham, Republican of South Carolina, travelled to the White House to present the President with a three-page blueprint for a bipartisan agreement to overhaul the nation’s immigration system. Details of the proposal were not released but Senator Graham noted that some of the elements included tougher border security, a program to admit temporary immigrant workers and a biometric Social Security card that would prevent people here illegally from getting jobs. Graham also said the proposal included “a rational plan to deal with the millions of illegal immigrants already in the United States.” He did not elaborate on what the plan would be. But in a recent interview, he suggested that onerous measures were unrealistic. So far, so good, but Senator Graham also linked progress on immigration to the healthcare bill now winding its tortuous path through the Congress. In a statement after the Obama meeting, Graham predicted that their effort would collapse if Senate Democrats proceeded with a strategy to pass a healthcare bill through a simple majority vote — a process known as “reconciliation.” Senate leaders say they are committed to doing just that. The President had earlier met with a group of 14 immigration advocates that stressed to the President the urgency of moving forward with a plan that rationalizes the nation’s dysfunctional immigration policies. There are an estimated 12 million people believed to have entered the US illegally. In the fiscal year that ended in September 2009, the U.S. deported 388,000 illegal immigrants, according to the Department of Homeland Security — up from 369,000 the year before. After meeting for more than an hour with Obama, immigration advocates that included leaders from the National Immigration Forum, La Raza and the SEIU told reporters they want Schumer-Graham blueprint released before a planned March 21 demonstration at the Capitol, with a bill introduced in the Senate soon thereafter. Immigration advocates seemed most pleased. Angelica Salas, director of the Coalition for Humane Immigrant Rights of Los Angeles, said the President agreed to help get a legislative framework out before the public in advance of the rally. Hispanics supported President Obama in the general election by a two to one margin. The most recent polling shows that while the President’s approval rating among has slipped since its peak at 73 percent last Spring, it still remains above 60 percent. I know…..But he needs to make the ethnics happy in SC…cause the right ain’t happy with him….. At all….. It fits our needs perfectly the advantage of immigration reform on the country: Greater supply of unskilled workers, a younger workforce, and skilled workers in needed sectors. But there is also a disadvantage of immigration reform like Greater poverty, more educational cost, lower unskilled wage levels, and increased danger of terrorism. Thanks to the post!